At left, colors represent ozone levels in March 2011. At right, colors representing chlorine monoxide are shown. 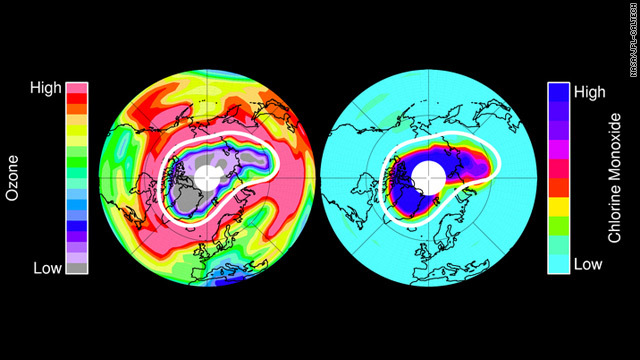 Loss of the Earth’s ozone layer above the Arctic last winter was unprecedented, scientists at NASA’s Jet Propulsion Laboratory told CNN on Monday. In findings published in a new study in the journal Nature, scientists said a hole in the ozone was caused by an unusually long period of low temperatures in the stratosphere, the protective layer that shields the Earth’s surface from harmful radiation. While ozone loss is a sadly common occurrence at the South Pole, recent findings document a similar event happening at the Earth’s northernmost point. “We’ve never seen that kind of phenomenon in the Arctic before,” Michelle Santee, an atmospheric scientist with the Jet Propulsion Laboratory, said. Although it was comparatively small – “The area of the Arctic loss zone was about 60% the size of a typical ozone hole,” Santee said – the ozone hole has raised concerns among atmospheric scientists. “The same process that destroys the ozone layer in Antarctica – chlorine and other man-made compounds such as CFCs (chlorofluorocarbons) – takes place here also, but it’s just that it never occurred in the Arctic to the same degree,” Santee said. Now the term ozone makes sense to me "0 Zone." On a positive note, we won't ever have to worry about hell freezing over. No.. the people of the arctics and north pole became so godless that this is His way of punishing them.. Don't come looking at my refrigerator or my spray cans.. they ain't the cause for this.. I mean, is it written in the bible that a spray can causes ozone to be depleted? NO! There's your reason! Haha, is this a joke? Another homeschooled science major. Ha!